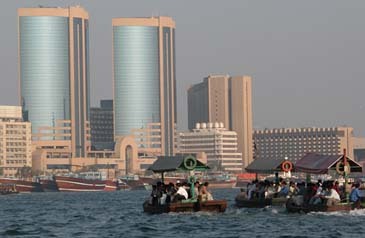 People in Dubai go home by sea taxi after work. "It's the Disneyland of the Gulf" says to my guide. Certainly a description I find hard to dispute when faced with artificial-palm shaped archipelagos, sumptuous shopping malls, and seven star hotels. Currently under construction is ‘Dubailand' which promises to be 100 times larger than Monaco and will feature the world's tallest building and largest shopping mall, a Pharos Theme Park, a Dinosaur World attraction, an indoor ski slope and an Ernie Els designed golf course, plus 50 new hotels (including one underwater!). Is there anything Dubai won't do to attract tourists? Seemingly not. Forty years ago there were three hotels, now there are over 300, and seemingly breeding at an exponential rate. Last year Dubai welcomed five million visitors, by 2007 the prediction is ten million. Not bad for country with no natural, historical or religious sites of note. One of seven sovereign sheikhdoms that form the United Arab Emirates following the British withdrawal from the Gulf in 1971, Dubai was for decades known as ‘the city of merchants', with the local dhows plying their seafaring trade around the Indian Ocean and into the Mediterranean Sea. This sedate trading and fishing lifestyle continued until the mid '60s when escalating oil revenues economically catapulted the country into the 20th century. Aware that the oil boom could not last forever, Sheikh Rashid bin Saeed Al Maktoum, father of the present ruler Crown Prince Mohammed, embarked on a lavish building program to establish Dubai as a major tourist centre and the region's premier business hub. His vision has well and truly succeeded; tourism accounts for 20% of the Emirates' burgeoning revenue. It is along the Arabian Gulf, where hordes of Indian and Pakistani labourers work around the clock erecting futuristic, flashy, hotels that the tourist boom is so overtly manifest. Restraint is clearly not part of the vocabulary of architects working feverishly in this part of the Gulf. But it all seems to work: even bad taste doesn't look so ghastly in bright sunshine, against a backdrop of golden sand and blue water. In many ways Dubai is reminiscent of Las Vegas without the gambling; at times an unsightly amalgam of all that is kitsch and where the lily is enthustically and expensively gilded. The city seems to live by the credo, "If it ain't broke, knock it down and build metal high rise with plenty of glass." As a result there are few heritage buildings and seemingly little connection with the Emirates' proud past. 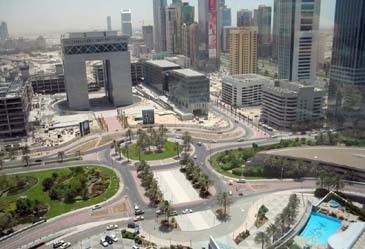 Strategically sited between east and west, Dubai was always a flourishing commercial centre. Around 2000BC, traders sold pearls to Babaylon and Mesopotania. By the sixth century Dubai merchant dhows ferries Chinese silk and porcelain to European markets. In 1892 a tax free port was established, and during the early part of the twentieth century, regular visits from British steamships further enhanced Dubai's prosperity. Unfortunately few relics of this early history remain. 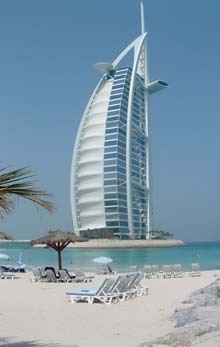 Rising imperiously above the Arabian Gulf is the icon of the new Dubai – the 7-star Burj Al Arab Hotel. Taller than the Eiffel Tower, this sail-shaped shard of steel and Teflon-coated glass comes with gold fittings in every suite, a jewel-studded lobby, and a 20 m fountain in the foyer. Naturally it isn't cheap. The Royal Suite is on offer for about 8,500,000 won/night, though this includes a butler, rotating beds, a private cinema and a loo which emits singing bird sounds when flushed. On the 27th floor of the Burj one finds the Al Muntaha restaurant with its stunning views across the Gulf. However, if vertigo is a problem, there's always the Al Mahara. This subterranean restaurant is accessed by a three-minute voyage in a mock submarine, and is furnished with giant fish tanks cared for by a team of 20, including a chef who prepares special food for the aquatic inhabitants. Offshore from the Burj, two artificial islands shaped like palm trees are being created. Snaking 16km from the shore into the Gulf, each boasts 65km of coastline and will accommodate another 40 hotels and 2000 luxury villas. When completed the project enlarges Dubai's coastline from 72 to 192 klm, while tripling the available beach space. International soccer players such as David Beckham and Michael Owen have acquired holiday homes on one of the islands, Palm Jumeirah, which is already visible from space. On the other island, Palm Jebel Ali, 1000 stilt homes designed to spell out an Arabic poem, are in the planning stages. It's only along the Dubai Creek, which bisects the city, that I feel any sense of antiquity. Anchored in the shadow of a posse of testosterone high rise buildings, is a flotilla of aged, creaky, wooden dhows still supplying trade to India, Iran, and Oman as they have done for centuries. Buzzing about on the Creek between these ancient sedate craft, are the abras - wooden waterbuses ferrying the populace between the northern and southern shores. Each abra accommodates 20-30 people, and with a cost of only 60 won, an abra ride is arguably the best way to appreciate day-to-day life, mingle with the city's real inhabitants, and view Dubai's futuristic skyline. It is possible to hire an abra by the hour (for about 6,000 won) and take a longer leisurely ride along the Creek as far up as the Al Maktoum Bridge. Just don't expect a guided tour and sparkling repartee; best to take a map. Deira (part of the northern shore), contains a number of souks (markets), the most significant being those selling spices and gold. The spice souk, conveniently located near the abra station, is the most interesting. Run mainly by Iranian merchants, it's a warren of alleyways and narrow streets where intoxicating aromas such as sandalwood, myrrh, cloves, cardamom and frankincense are on offer, as well as chunky white crystals used as aftershave balm. The best bargain is saffron – very cheap by Korean standards. A few streets away is the gold souk – a modern, high-ceiling collection of arcades, containing 400 shops and reputedly, the world's largest retail gold market. Everything, from ingots to the most intricate necklaces, is on display. Like the spice souk, it's hassle free, and similar to all Dubai souks (and some hotels), haggling is de rigueur. On the southern shore in Bur Dubai, (close to the excellent Dubai Museum) is the textile souk where exotic dress materials and cheap garments are for sale. Perhaps the most informative way to explore Dubai is to take a Big Bus City tour. Unlike some of the other offerings, the ‘Big Bus' is relatively cheap (24,000 won) as the ticket is operative for 24 hours and may be used over two days. Commentary is in English, and it is possible to hop on and off at any particular site that takes the fancy. One route visits the attractions around Bur Dubai and Deira, including Wadi City Shopping Centre, Dubai Museum, Deira City Centre, the Gold Souk, and Little India. The other route takes in the beach scene, including Palm Island, Jumeriah Beach, the Burj al Arab, and all the other up-market hotels. For all the hype, urban Dubai is generally a rather soulless place, and the shopping, despite the 34 ostentatious new shopping centres, is overrated. But obviously, as a tourist honey pot, it has a lot going for it, including superb beaches, a perfect climate November through March, an array of outstanding hotels, sound hygiene, drinkable water and liberal alcohol laws and is served by the excellent Emirates Airways. English is widely spoken, the people are courteous, and as crime is almost unknown, it is safe to wander the city at any time. There are no beggars, biting insects or graffiti.